THE ANGLICAN CHURCH of All Saints in Parque Taoro, Puerto de la Cruz, is over 125 years old, making it the oldest Anglican church in Spain. Many visitors to Tenerife are surprised to find an English-style church here. This small enclave of the Church of England owes its existence to a handful of dedicated Christians who, in the late 1800’s, met each Sunday for Morning Prayer. These Services were read by the British Vice-Consul, Mr Peter Reid. Donations were given by people of many different nationalities and denominations towards the eventual building of All Saints Church, in what was then known as Puerto Orotava and is now Puerto de la Cruz. The first service was held in the church on 14th June 1891 but due to an outbreak of smallpox there was no formal opening at that time. That was delayed until 1st November 1891 when it was dedicated as All Saints Church. 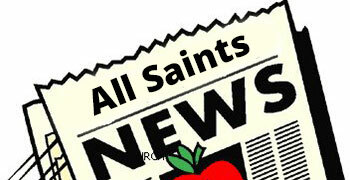 On 15th January 1893 the Bishop of Sierra Leone, in front of a congregation of 189, formally consecrated All Saints. We have on the wall a copy of the Deed of Consecration. 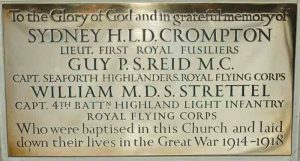 The brass plaque that commemorates three lives lost in the First World War. Another historical feature in our Church is a Font with a brass plaque in memory of three parishioners who were baptised in the church and subsequently lost their lives in World War One; a tablet bears the inscription “you shall love the Lord your God with all your heart all your soul and all your strength”. There is also a beautifully carved wooden pulpit. The east wall behind the altar has a carved oak reredos in memory of a previous parishioner. The original Pipe Organ in the church was a Bevington built in the UK around the turn of the century. The interior workings of this have been removed, though the keyboard and pipes have been retained to enhance the overall appearance of the church. Today’s modern, digital electronic organ sits in front of the Bevington in the Sanctuary. 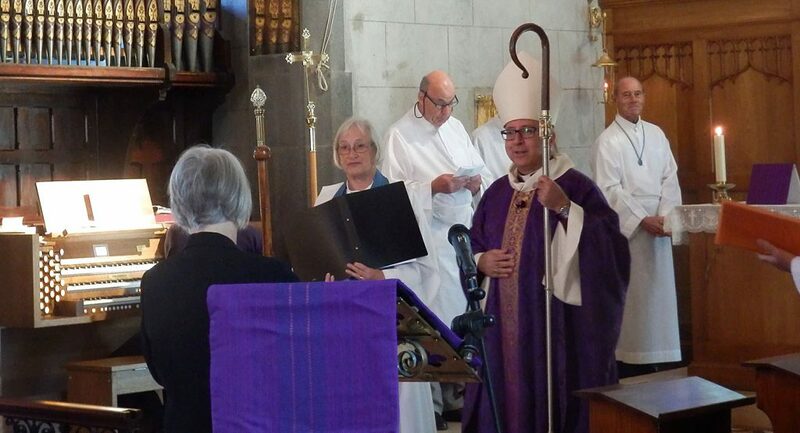 It was installed during a considerable programme of renovations carried out in 2016, made possible in the main by the generous donations of two members of the congregation. The building is Early English Gothic style with pairs of lancet windows to the side aisles. In the Sanctuary there is on the south wall a large scale reproduction of the Light of the World by Holman Hunt. We also have some wonderfully vibrant stained-glass windows depicting figures of the prophet, apostle and martyr and the wording from Te Deum. Some of these windows were brought over from America around the time the church was built.